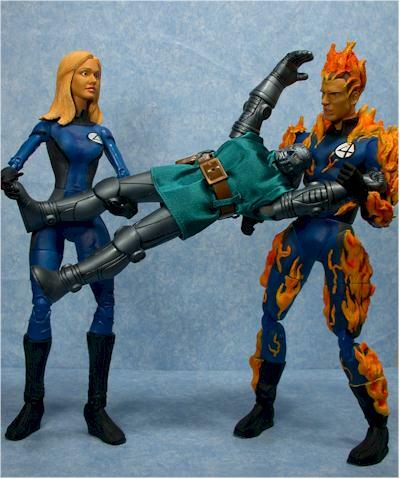 I just reviewed the 6" series of Fantastic Four figures from Toybiz last week, and spent some time talking about the four characters, Stan Lee, and other useless information. So let's switch gears with tonight's review, and talk about the format of this set of toys. 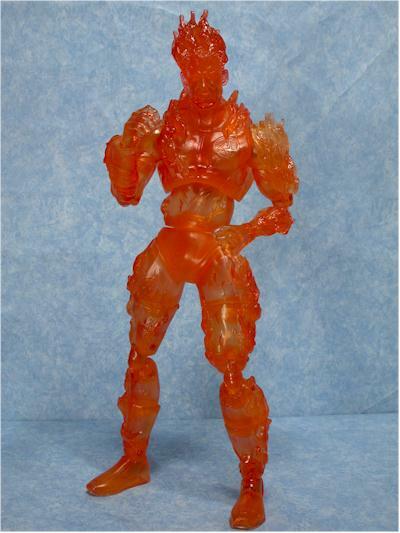 Rotocast has become a popular alternate for making figures, particularly large ones. 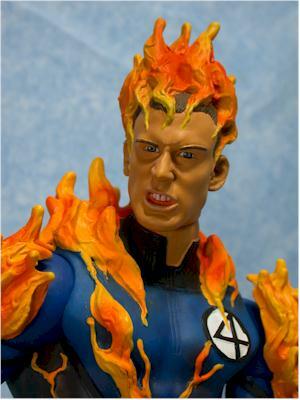 Most people are accostumed to injection molded toys, in which the plastic is forced into the mold under pressure, completely filling it. Rotocast is slightly different, and involves turning the mold as the plastic is injected, coating the inside but not completely filling it. The mold turns as the plastic hardens, creating the hollow piece, which is of course cheaper than the solid version. Rotocast has been around for a very long time, and it's not particularly complicated in its basic form. It fell out of favor, particularly with any toys geared towards collectors, because the detail, articulation and quality were often poorer than injection molding. That changed though several years ago, and new techniques in the process now allow companies to create very detailed, fairly well articulated figures this way, at an overall cheaper cost. While some companies have used it for smaller figures, like the Family Guy series from Mezco, most are using it for large scale figures. 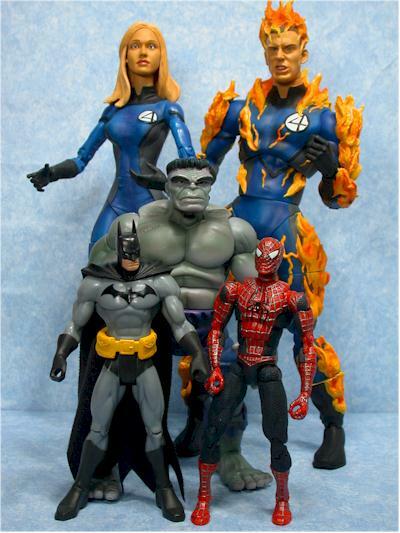 Toybiz has been particularly prolific in producing 10 - 12" rotocast figures of their most popular lines, like Spider-man, Lord of the Rings, and the Hulk. 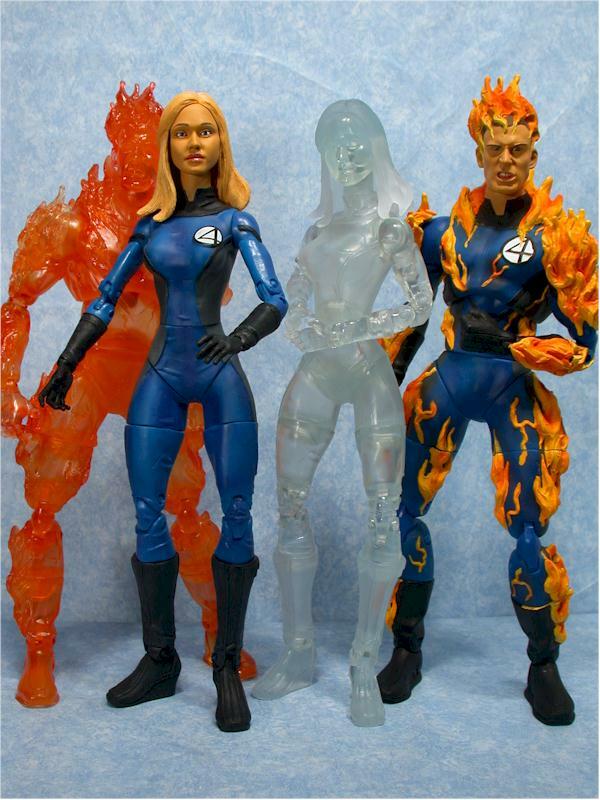 It's no surprise then that we now have a set of 12" rotocast Fantastic Four figures from them as well. There are only four figures in the set right now - and before you say 'duh', let me add that there are two Johnny Storms and two Sue Storms. No sign of the Thing or Mr. Fantastic yet, but one can hope. 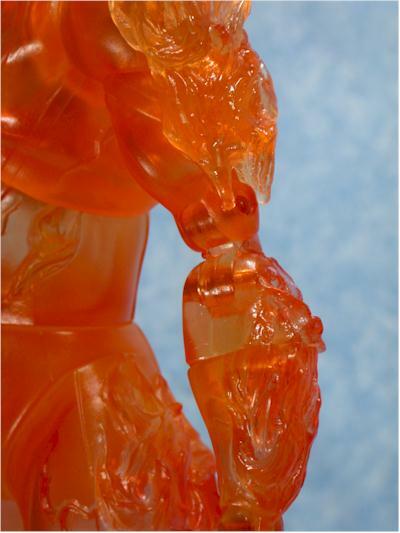 Both Johnny Storms are engulfed in flames, but one is painted while the other is cast in a translucent red plastic. 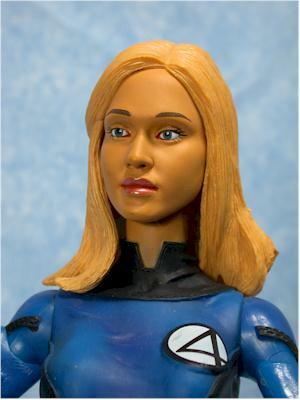 Sue Storm also comes painted, or in a completely clear version. These are popping up at Wal-marts right now, but should be all over the place very soon. You can expect to pay around $10 each. If you've bought other large rotocast figures, you'll recognize the open box approach. Again, this saves money, and since most of the large figures have no accessories (or those that can be secured other ways), this style works well enough. Of course, it also means the figure is more prone to paint damage on the shelf. Watch out for scruffs and scrapes when picking yours out. The poses in the package are a little odd, especially Sue's. It's clear they posed Johnny in a particular way when putting him in the box, so you'd assume they were doing the same with Sue. So why does she look like she's copping a squat? I'm pretty sure that this Sue sculpt matches the 6" version, but the extra size really helps bring out the Alba look even more. I think a lot of folks will be happier with this head sculpt than the smaller one, but I'm pretty sure that the only difference is in size. Either way, this is the best version of Jessica Alba we've gotten. That's saying a lot considering we've gotten both Sin City and Dark Angel figures in the past. The Johnny head sculpt is new, with a funky grimace on his face. It's not constipated though, it's more feral. He honestly looks like he's growling, just about to take your nose off your face. The flame sculpting isn't quite as cool on the larger figures as it was on the smaller versions, but it's still pretty well done. 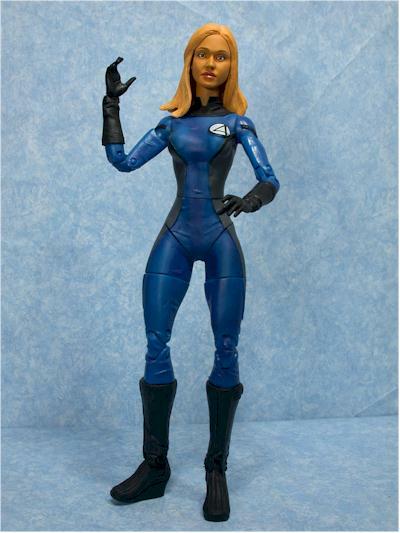 The proportions on both bodies are good with the exception of the elbows and knees (they seem too thin), and the scale fits in with most other basic sixth scale figures. The clear versions of Sue and Johnny have no paint apps, which is a little unusual. The smaller clear version of Johnny at least had black eyes, but these two are bare. In the case of Sue though, that makes perfect sense. 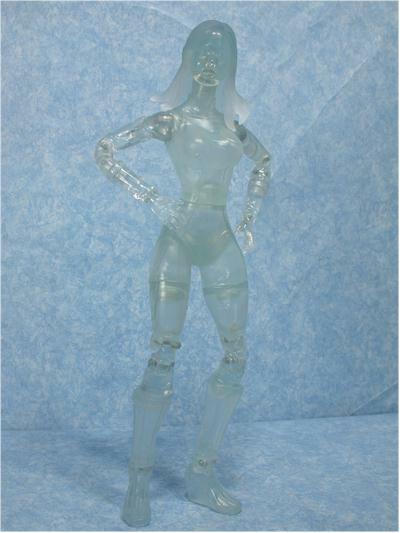 The clear plastic reminds me very much of the recent Violet figure from Disney, but with better articulation. The painted versions of Sue and Johnny are good, especially considering they are mass market toys, aimed at kids, and coming in at ten bucks. The faces are the best of the work, with nice eyes, even skin tones, and some good small detail work. The bodies aren't quite as good though. There's some slop and over spray on the flames on Johnny's body, and the white on both 'fours' isn't as consistent or even as it should be. There's enough scuffs on the bodies from the open boxes to be a tad annoying as well. Both figures come with a nice range of articulation, certainly enough to make kids and collectors happy. Starting at the top, there's the all important ball jointed neck. Even with Sue's long hair, it has a very good range of movement. There's also ball jointed shoulders on both, double jointed elbows and knees, cut forearms at the gloves, pin wrists, cut waist, V-joint hips, cut biceps, cut calves at the boot tops, and pin ankles. Johnny adds one more point with an additional chest joint. The elbow joints on Johnny are a little weird looking though. The connecting disk is very thin, the flames increase the size of his limbs, and he has Popeye forearms. That makes the elbow look even thinner, and out of proportion. The knees suffer from this as well, but not quite as much. 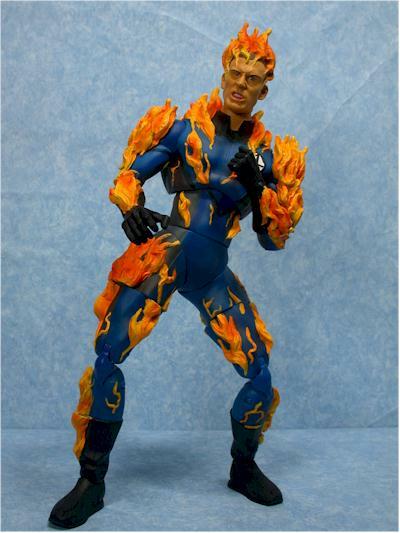 Sue doesn't have this same problem, probably because her arms and legs aren't bulging with flame like Johnny's. Neither of these figures have accessories, which isn't particularly surprising in this scale and style. Add to that the fact that neither use a whole lot of gadgets, and you'll see that it would have been a stretch to add much of anything. Kids should have a great time with this pair, especially after the film when many from this generation will be introduced to the characters for the first time. Even without accessories, these are excellent figures for the price. Considering some of the much weaker looking, poorer articulated, and just plain dopey figures we get in the $12 - $15 range these days, these are a real treat. The package allows for paint damage, so be careful when picking yours out. Look for one that hasn't gotten scuffed or scratched on the shelf. Other than that, you should be good to go! - omgcnfo.com has the figures up for pre-order at $10 each. - Amazon.com has them listed as coming on May 15th, for $9 each. - Fireside Collectibles doesn't have the figures, but they have a great price on the Thing maquette at $140. - Here's a guest review of the ML5 Mr. 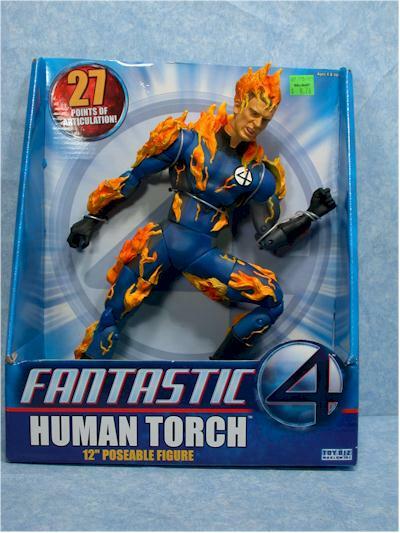 Fantastic, and the ML boxed set of the Fantastic Four. - Here's my reviews of the Ultimate Mr. 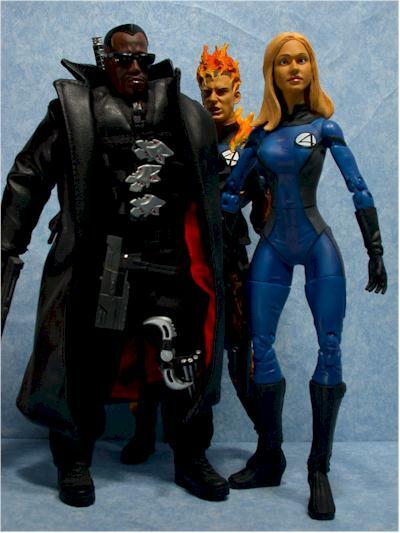 Fantastic bust, and the Dr. Doom maquette. - and then of course, there's the official Fantastic Four movie site, with trailers, screen savers, etc.